The arrival of the 20th century brought with it a strong interest in world cultures and ethnicities, and the advent of the Autochrome process in 1907 helped to fuel people's curiosity about life beyond their borders. Autochromes enabled illustrated magazines like National Geographic to embellish their pages with natural color photographs made in exotic locales, and travelogues - public lectures featuring projected Autochromes along with dramatic tales of adventure - could dazzle audiences in a way that black-and-white projections could not. Fred Payne Clatworthy, a professional photographer in Estes Park, Colorado, published Autochromes in National Geographic and also projected them (using a special large-format projector) in travelogues. 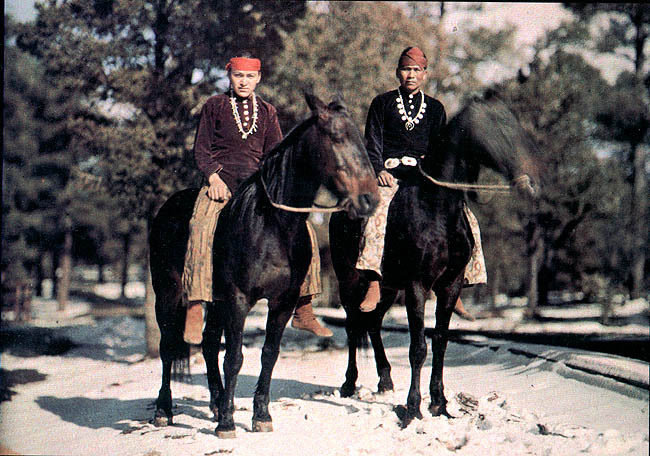 Clatworthy's Autochromes included landscapes, seascapes, dazzling sunsets, and views of Native Americans. Clatworthy was by no means alone in documenting cultures with Autochrome plates. There were other well-known Autochromists whose work was featured in National Geographic between 1914 and the mid-1930s. And in France, the banker Albert Kahn devoted his fortune from 1910 to 1931 to assembling an "Archive of the Planet," sending photographers to the far corners of the Earth to make Autochromes. Kahn's monumental collection of 72,000 Autochrome images is now preserved as a museum. The photography historian and critic John Wood, author of The Art of the Autochrome, notes that Clatworthy made more than ten thousand Autochromes-- and praises the artistic quality of his images: "There was no one else like him in the history of the American Autochrome...Fred Payne Clatworthy was a master of color and had an understanding of color composition that has still not been surpassed by any photographer who has come after him. Of the several hundred Clatworthys I have seen there is not one that is not beautiful..."
Copyright © MMVII The American Photography Museum, Inc. - Image Copyright © MCMLXXXIX. All Rights Reserved.